I love biscotti, as I sit at my desk working I crave one. For many years, I struggled to make them taste good and be able to slice them into thin enough pieces. 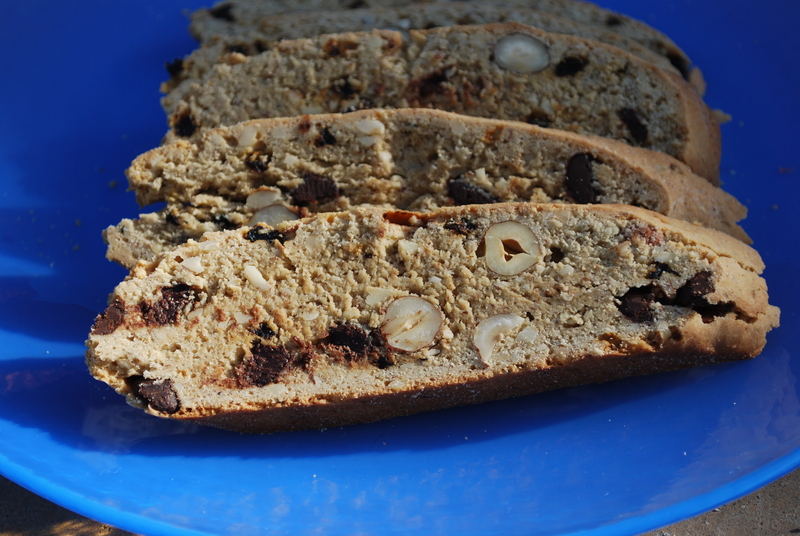 The dilemma was how to make biscotti with the maximum amount of nuts without being too difficult to slice cleanly. These are latest flavor I recreated. Just sweet enough, with a blend of flavors subtle enough not to interfere with your demitasse of espresso and crisp enough to stand up to dunking in hot tea. It is a great taste combination. If you like hazelnuts, you will love these. I recommend keeping a heavy duty very sharp serrated knife hidden just for slicing biscotti if you plan to make them often. Preheat oven to 350º. Line a rimmed baking sheet with a silpat or parchment paper. I prefer half sheet aluminum pans. Dark colored or non stick coated baking sheets lead to different results. Combine 6 cups of the flour with the baking powder, orange zest, and salt in a bowl and set aside. Reserve the last cup of flour separately. Crack the eggs in a glass cup and after checking them for shells or blood spots place them in the bowl of your stand mixer, add the sugar, and beat on medium speed until light in color and thick. Add the oil to the eggs. Beat the mixture, starting at the slowest speed, until well combined. Add the espresso. Add the ground nuts and mix. Next, add your pre-measured flour containing the baking powder salt and orange zest to the mixer. Start the mixer on the slowest speed. 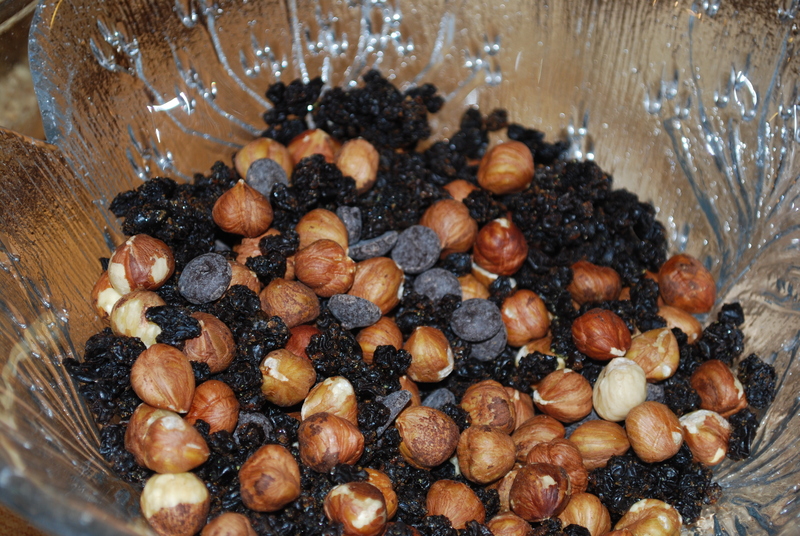 Lastly add the currents, chocolate chips, and hazelnuts. Mix gently to combine and distribute throughout the dough. Remove the dough from the mixer. It may be slightly sticky. Add some or the entire last cup of flour as you kneed the dough lightly with your hands until it is smooth. Roll it into a smooth log and separate the dough into 4 equal pieces. Form four uniform, compact logs, about 2 inches in diameter and 10 inches in length. Place the logs carefully on the silpat lined sheet, two logs to a baking sheet. Bake until golden in color 25-30 minutes. Remove the baking sheet from the oven. Turn the oven temperature down to 200º. Carefully place your rolls on a cutting board without breaking them. Cut immediately on a sharp diagonal with a long serrated knife or very sharp Santoku knife. Return the sliced biscotti to clean cookie sheets lined with silpats or parchment paper, being careful not to break them, and spread them so air can circulate all around them. 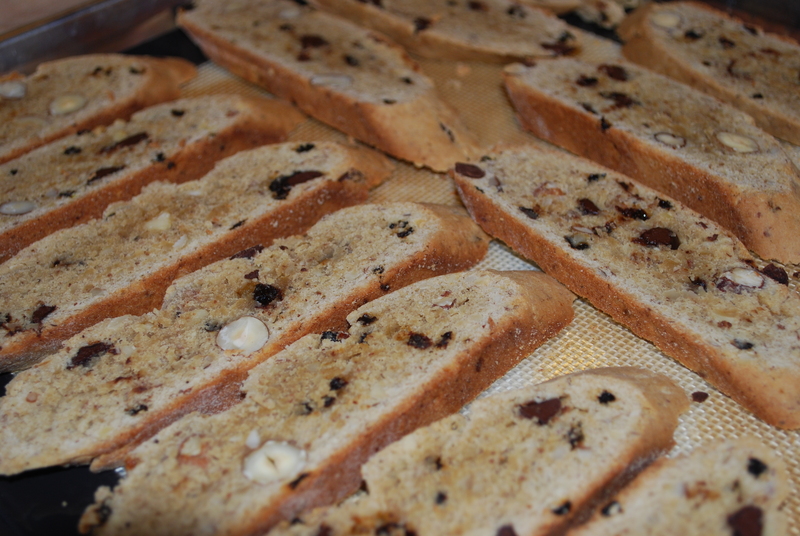 Toast the biscotti in a 200º oven for two hours. After you turn the oven off, leave them in the oven another 45 minutes or even better, overnight. They should be crisp. 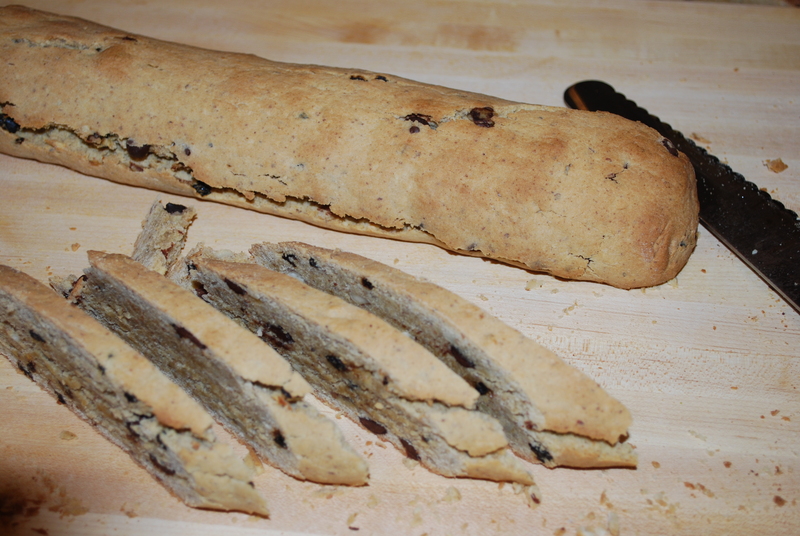 One recipe makes 60 to 80 depending on how thick you slice the biscotti. These are wonderful for serving with tea, coffee or with fruit as a light desert. They are also great as part of a desert buffet. Very cool! Thanks for sending this. I wish we’d made these while I was there. (I know, too busy.) Biscotti seem to last a long time, but how long actually? It’d take me a while to get through 6 or 7 dozen biscotti! I’ll go look at your other recipes. Hi Leo, thanks for asking. I store my biscotti in an air tight tin. I line it with wax paper, place the biscotti inside and then top with another layer of wax paper. I have kept them for a month or so without any loss in flavor or crispness. Be sure to use very fresh nuts. Buy them from a source that has a big turnover so that the nuts have not been sitting in the store forever. PS, I love to give away little baggies with a few biscottis in them to my friends. Share!